I love your sweater design, but I especially love your baby belly. Congratulations! Love your colour choice its very wintery reminds me of Chronicles of Narnia for some reason. oh my goodness. i’ve done a little bit of knitting with 2 colors, but nothing as complex as this — but boy would i love to try! this is absolutely stunning! This is so, so gorgeous. I adore your design, and your baby belly! I love this sweater. So beautiful, color choice is perfect! SO gorgeous!! I don’t know how you manage to crank out so many fab patterns. Love this one so much. Love the baby belleh too! What a lovely, lovely, perfect sweater. Great job! Beautiful sweater and belly 🙂 Congrats! Lovely sweater, and I am sure you will appreciate it after the baby arrives too! I wonder if there is a supplier for this yarn in Canada? The colours are gorgeous, and it would work so well with my work wordrobe. Beautiful sweater! And I also appreciate your recommendation of the Harrisville yarn–I’ll have to try it. A beautiful sweater. I especially love the blending of colors you got with the greys and plums – one of my favorite color combinatitons. Congratulations on the baby and on the gorgeous new design. I’m such a sucker for both grey and purple. I would love to be entered in your contest! That is indeed a very lovely sweater! With baby due in December hopefully you’ll be able to wear it and enjoy! The sweater is lovely! I really like the color palette you chose. If I were to knit it, I think I would do mine just the same. Great work! Wow…what a gorgeous sweater. It looks like a classic that will take you through many years. Congrats on your future arrival! This sweater is beautiful! The color choices are just perfect. Beautiful sweater, I will have to try this yarn. And congrats on the baby-in-progress. Wow — that’s a beautiful pattern. I’ve used Harrisville before, and agree with you — it blooms wonderfully! Congratulations on your wip due in Dec! Beautiful sweater, & congrats on the baby! The belly shot brought a smile to my face. One of my LYSes also carries Harrisville on cones. Yum. And you look beautiful. Don’t be self-conscious about the baby belly. I gained 42 lbs with my first (he was right on time) and 37 with my second (she was 16 days early), and I’ve more or less bounced back to normal. Congrats! That’s a beautiful sweater. I love the combination of purple and grey. Oh, Elinor, it’s even better than I had hoped from seeing the WIP photos! My friends are such a talented crew 🙂 Nice job, as always. Lovely! I need to make this. Lovely colors, great pattern, and a sweet deal for the winner. I love your design, so pretty! I love that cardigan – the colors works great together and the pattern is simply gorgeous. By the way – if I win it will be THE best birthdaypresent (I’ll be 32 Wednesday 7. oct). And win or not, it’s a gorgeous design. Wow, it’s gorgeous! What a lovely cardigan! What a beautiful sweater. I must try this yarn! I’ve been hearing lots about it, and your glowing recommendation may have just tipped the scale for me. This is so amazingly gorgeous! It’s very rare that I want to knit a pattern in the given colors but I want this exact sweater rightnow! Oh, that’s so lovely! That charcoal! I agree, Harrisville Shetland is a very special yarn – I love everything I’ve knit with it. The sweater is beautiful, and I can’t wait to make it. What a beautiful sweater. Perfect colors! There’s something about shetland yarn that just makes you want to knit – scratchy or not! Beautiful design and sweater. I love pullovers especially in the smaller weights. I love the colours in this design – they’re some of my favourites! And I think the cardigan looks great over the baby belly – although if it’s particularly cold the belly does start to get a bit chilly without extra layers on! Congrats on your new pattern – it’s stunning! I’d love to try a new fair isle project this winter. Keeping my fingers crossed! It is beautiful! I have a pile of this yarn waiting to be knit. I’m feeling inspired! And the linked photo is beautiful! It’s a lovely cardigan! Congratulations! It is a beautiful design, both timeless and elegant. Please add my name to your growing list. Beautiful sweater. Thanks for the contest. One way or another I think I’ll have to knit this in the Harrisville yarn, after you spoke so highly of it. I’m also excited to try steeking. Your images make it look not-quite-so-scary! I just recently found your blog and this sweater was a wonderful revelation–it reminds me of a foggy morning in Maine, with the sea lavender flowers coming up through the water at high tide. The muted, harmonious colors are just lovely. Congratulations on your creativity inside and out! I love your pattern! It would be perfect for my teenage daughter.I’ve never really been tempted to try colorwork, but this is so subtle yet lovely that I’m entranced. I hope I win! This sweater is amazing!!!!! The colors, the design, the model…everything is beautiful! I can’t wait to see your FO come December!!!! Oh oh oh pick me please! As soon as I saw the first picture I was ready to put this in my queue. To win the yarn to make it would make it all perfect! 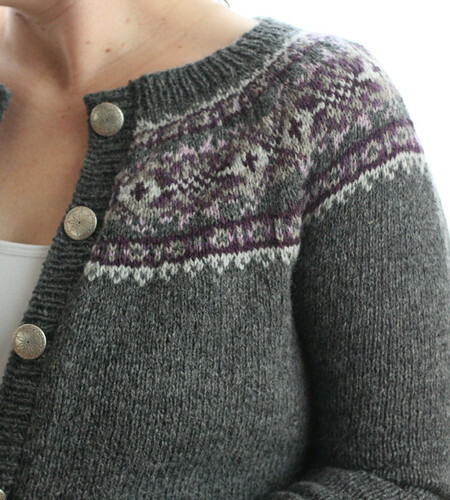 This is a beautiful cardigan, I can’t wait to get the pattern. So classic and gorgeous! I must admit that I’ve never seen or felt Harrisville Designs New England Shetland, so I would definitely love to win your contest! I love stranded knitting, so I am always interested to learn about yarns that blooms well. And your pattern is really very lovely. Oh my, that’s absolutely “plummy”, pardon the bad pun! Delicious! I am so excited about this pattern! It’s so gorgeous. I’ve never used this yarn, but will definitely try it now. Your glowing review of the yarn makes me anxious to try it out–please count me in! Your sweater is beautiful. Knitting for the first time with Harrisville Highland and enjoying the experience. Glad to hear so many good things about the Shetland yarn. lovely pattern and color selection! i look forward to trying this pattern someday! Wow, found the pattern posted on Ravelry and had to come over and check it out. The sweater is beautiful. The yarn review is great also. I’m going to check out the yarn and see the colors. Thanks. Oooohhh, those colors are divine! I want one! Now off to check out the pattern. I love the colors you used, and the pattern is beautiful! I haven’t knit with Harrisville’s yarns but your awesome review makes me want to. This cardigan is beautiful! I love the color palette you chose! I’m trying NOT to enter contests but this one is too beautiful to resist! It’s the prefect combination of pattern and yarn. Brilliant job! This is a beautiful sweater! Oh, and I love the “exploding belly” picture. You look fabulous! Yay & congrats! That sweater is lovely. And thank you for giving me another yarn to check out. Thanks for hosting this giveaway. It’s a beautiful sweater. What a beautiful sweater. I would love to try making it, especially since you said the wool does not “itch” next to your skin. Lovely. It’s absolutely beautiful and I would love to win! I just went to their website though and I’m confused – how come they call it Shetland when it’s spun in the US from wool from Australia and NZ? I absolutely adore the colours and would like to take part in the contest, although I thought Shetland can only come form the Isle of Shetland in the British Isles? That is a truly lust worthy sweater. And I’ve been wanting to do more colorwork . . . hmm . . .
Also, it looks beautiful modeled on your current body — your baby curves are nothing to hide. I followed the link from the ‘recently added’ page on Rav 🙂 It is a very nice sweater!!! I’ve never tried Fair Isle (even though I had some Fair Isle knitting classes on Fair Isle 2 years ago, using Jamieson’s yarn that I picked up on Shetland hehehe :)). I am very happy to see an ordinary, old fashioned yarn used it this beautiful garment. It makes me want to run to my own LYS and buy some local yarn. Wow this is beautiful! I have never tried to knit fair isle, but this cardigan makes me want to jump right in to it!! This is a stunning knit! I’ve been on the lookout for a fair isle yoke cardigan pattern like this for a long time – what a wonderful pattern! I’m not usually much of a purple person, but I’m quite taken with how it blends in with the greys. Lovely! What a beautiful cardigan! I really love the subtle color changes and I look forward to knitting this pattern. i am drawn to the way you blended the purples and greys together, very subtle and pleasing! Beautiful work! Love the “baby” picture. What a lovely sweater, Elinor – I could make a habit of knitting your patterns (I already have the Winter Sunrise hat in my queue)! It’s stunning. Loved it the moment it popped up on Ravelry. Congrats on another beautiful design and the baby as well. Finally the pattern I have been looking for! Genius! 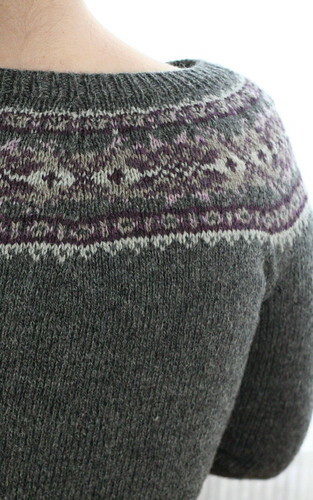 Beautiful sweater…I am looking for a replacement for a cotton fair isle sweater that died. I’m looking forward to knitting this one! Love the colors in the sweater – perfect! Oh my goodness — beautiful! What lovely yarn in combination with such a gorgeous pattern. I’d LOVE to knit this one. I love Harrisville shetland. Your cardigan is looks great in it. What a beautiful cardigan! Can’t wait to try this. What a gorgeous sweater and color choices! Can’t wait for the pattern release! The sweater is beautiful! Great job on the design & colors as they are perfect together. This is a lovely sweater! I enjoy working with Harrisville shetland yarns also, and am now thinking about how my stash yarns might work with this design. The shaping aspects of your design are appealing, too. LOVE the cardigan. It’s right up my alley! How gorgeous! I love the subdued color palette, and I’d love to knit one up for myself. Great pattern! I am especially impressed that you included the picture with your belly! Great! What a beautiful sweater and pattern! What a lovely cardigan. Was looking for something like this to make for my daughter! Didn’t see length till I looked at you special photo! Congratulations with being pregnant. Hope you will have a lovely baby. Love your new sweater design, colors and all. What a perfectly lovely sweater! And perfectly lovely belly – Congrats! OK, I lurk here mostly but the combination of a great sweater and a chance to win yarn have lured me out of hiding. 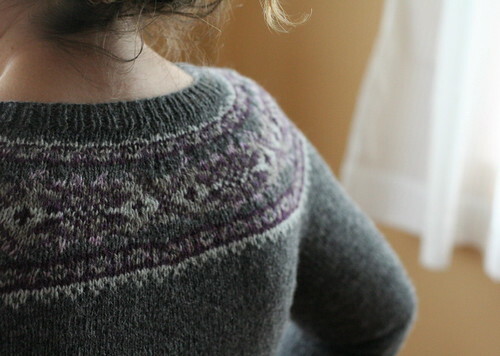 I love this pattern Elinor, it only drives me more to make something fair isle soon. The colors you chose for the sweater really are perfect! I know other people who rave about that yarn and it is high time I gave it a shot, as well as fair isle and steeking. (What a coincidence). Thanks for a great pattern and good luck with your final months as mom-to-be! This is such an awesome pattern! I love the fading in the colorwork. Would love to knit this in the harrisville shetland. Wow, that is amazing! I wouldn’t change a thing! I’ve done a fair isle yoke with worsted weight and now am itching to do more traditional fair isle and this is exactly what I want. Great job! love that sweater – congrats on the new baby to come! My, this is gorgeous! The colors are really lovely together, very wintery and Sugar Plum Fairy-esque. What a lovely sweater, and great colors. Thanks for sharing it and congrats on finishing with a new baby around. I have put the sweater into my ravelry queue. I LOVE it and will knit it even if (probably won’t)I don’t win. Thanks for the pattern and the possiblity of free yarn to make it!!! What a pretty sweater! Even if I don’t win, I think I will be purchasing the pattern. 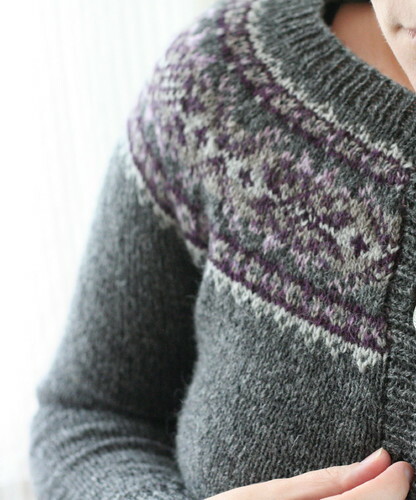 I love fair isle (and I am so excited to have the Alice Starmore fair isle book!). Wow, amazing sweater! I would love to try and make this! Hi, Lovely pattern! I am longing to start a fair isle project with lots of subtle shade changes. Thanks for the new pattern! Love the design and love Harrisville yarns! Lovely, lovely, lovely! A must knit for me! Love this – really beautiful. The pattern is probably way above my competency, but I’d love to give it a try! Beautiful sweater! I’d love to make this and will have to search for the yarn. Sounds like a wonderful yarn to knit with and then enjoy a wonderful finished project. Thanks for wanting to share! What a lovely cardigan! I would love to try both the pattern and the yarn. That is just one gorgeous sweater. And I love your baby belly, it’s gorgeous, too! What a beautiful sweater! Great job! Gorgeous! I love the color combination. I’ve got sweaters on my mind as I’ve been a pullover girl until now. Something about nursing a 7 mo old makes cardigans considerably more attractive! oh i lovelovelove this sweater!!! Beautiful! Purples and grays are my colors. I am adding this to my queue immediately and I’d love to be entered for a chance to win the yarn. awesome sweater! it looks like the perfect wear-with-everything cardigan…perhaps a nice contrast with your previous post? That’s a beautiful sweater! I can’t wait to make one! Wow, I love it – and I can get Harrisville locally 🙂 it’s all good! Gorgeous sweater. Grey is a staple of my wardrobe and I’ve recently rediscovered my love for purple, so this is definitely going on my “to knit” list. What a gorgeous cardigan. It’s been a long time since I’ve been as excited about a pattern as I am about this one. I can’t wait to make this. Thank you! Gorgeous design E! I think what I like best is that you did choose colors that were so complimentary…they really are a stunning combination! I absolutely love this cardigan. And your choice of colours is spot on. Beautiful sweater, I’ve been looking around for a pattern to make a first stranded sweater for myself, this is almost exactly what I’ve been looking for. Congrats on the pattern and the soon-to-be new baby. Wow, what a great sweater. I love the gentle colors. I live in KC and love to make a special trip out to the Yarn Barn, it’s always worth the drive. Congrats on such a beautiful design!! Oh my, such a beautiful design! I will definitely purchase this pattern once it’s available. And I share your love of Shetland. It’s top on my list too. I’ve not yet had the chance to try Harrisville (it’s not available where I live), so I would really love a chance to win this generous giveaway. i adore this cardigan.Beautifull design! I recently discovered harissville. The others whiskey renolds and knit picks are impossible to come by out here in the netherlands. And pretty soon you get directed to rowan tweed etc. Luckely a friend of mine discovered that one yarn store ( just one alas ) has started to sell this yarn. I ordered it and fell in love. Your sweater is beautiful. It’s a perfect combination of yarn and pattern. I would love to try knitting your sweater! what a gorgeous cardi! 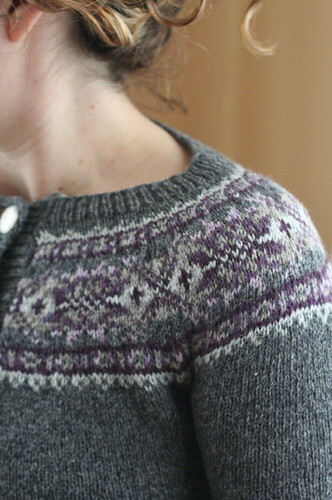 I love the fair isle in purple on the gray. What a beautiful design! The grey and purple are wonderful together. I absolutely LOVE this pattern! I really like the lace effect that takes place at the top and bottom of the fair isle work! I will definitely be putting this on my list! I was questioning the softness of this wool so it was really reassuring to see that you don’t find it too itchy. I have their color card but have been hesitant since the samples have not been washed and fill a bit scratchy. Now I can order with confidence!..Thanks again! It’s gorgeous. I’m such a sucker for purple and gray, I can’t wait to knit this. What a beautiful sweater. Yes please! I can’t wait to knit it up. Wow–what a great sweater design! The colour combination is beautiful! Wow! Very pretty sweater. I have a bit of this yarn in my stash that I got by chance for a great price. I think I need to knit up a swatch and block it to see the magic! Lovely sweater! I will certainly be purchasing it, but I would gladly take it with yarn if I win!! It’s beautifully designed. I recently finished a fair isle yoke baby sweater for my daughter and I am hooked on color work. Thank you for offering this give-away. i love working with many colors at once, love knitting and the colors in this sweater! That’s a great sweater! I love the color changes! My god- that is amazing! I really hope I win, I love colorwork! Beautiful and very wearable sweater! What a beautiful sweater and I think it looks great on your bump too!! Love the sweater! – I want to make both – pullover and cardigan! Beautiful sweater…. the yarn, the colors and design. I love all the baby knits here! What an adorable little girl you have. She’s a great model. It’s just beautiful Elinor! Love it! This pattern is absolutely divine and the colours are just beautiful, I’ve not seen this colour combination in fair isle before. Great sweater, it will be going on my list of to do knits! Awsome! Beautiful cardigan. Your pattern and color choice is perfect! Best to you through your 3rd trimester. Very pretty use of colors! I love this cardigan – and it is now in my list of must does for the year – if I only had some yarn……. Love the sweater. The colors are perfect. Purple and gray combinations are wintery and lovely. I also love the Yarn Barn, even though it is a bit of a drive! Just linked to your site for the first time, from Grumperina, I think. Lovely, lovely sweater. I was around in the 60s when fair isle cardigans were all the rage and you could buy kits from England with the yoke already knit. You knit the body and then grafted the yoke in place. Looking back, that took all of the fun out of it, but we didn’t know that at the time. I just added your blog to my favorites list. Now to read the archives! Congratulations on your pregnancy! Love the cardigan. I really don’t think I could love this pattern more, it’s so beautiful. Now I’ve got to figure out how I can add this to my long queue this winter! Lovely! I’ve been debating my next fair isle project and this might be it. And even if it isn’t next it is now in my ravelry queue. Beautiful work! Thank you for a beautiful design and a fabulous giveaway! I’m jealous of your LYS. I love the idea of this kind of patterned yoke sweater, but this is the first one I’ve wanted to knit on the spot. Beautiful. Although I have never attempted fair isle, I have wanted to for a while and this seems like the perfect sweater to get started with! And since I am already three months pregnant, that gives me six months to accomplish that in! 🙂 Really looking forward to this pattern’s release! Oh what a gorgeous cardigan! Great sweater! I love Harrisville, but usually only pick it up at wool festivals – and I have a stash that may be perfect for this sweater! The only acceptable excuse for not wearing this gorgeous sweater is your precious little 🙂 Congrats on both!! What a stunning design job! And your colors are beautiful — so much of a successful fair isle sweater depends on the color choices & you’re obviously an expert! Enjoy that December baby, I have one of my own & he’s a great handful! what a gorgeous pattern! I especially love your choice of shades of gray and purple. Great choices! My word! Your cardigan is so lovely! Purple and grey is one of my all time favorite color combos! Lovely! wow, harrisville is a pretty awesome company! i have to admit i’ve never worked with their yarn, though. i love the baby belly photo 🙂 the cardigan is beautiful and the buttons are my favorite part! I love this cardigan! The colors remind me of a grown up version of the fair isle sweaters that my grandmother knit for me as a child. I’ve never tried color knitting or tried steeking before, but your pattern definitely looks worth the effort of learning! Oh, pretty!! I’m looking for a new stranded project and this is beautiful. I love the heathered gray and purple together. I also am a big Harrisville Shetland fan, and will certainly want to purchase the pattern! LOVE the colors and the belly is cute too. I’d love to try out the pattern and yarn – it looks just lovely! The sweater is beautiful. I just love it. Wow, it’s gorgeous! And I’m a sucker for wooly yarns, too — I’ll have to track this one down. it is absolutely beautiful! i love the colors you chose and how exciting to have designed such an intricate design and pattern! My very first knit project ever was a fait isle sweater, i have not had the chance to do another since but would so love to! great success on sales of the pattern! Hi Elinor! What a lovely sweater!! If that’s doesn’t inspire me to try my hand at my first stranded yoke cardigan, nothing will. And thanks for the link to Harrisville yarns. Wow, that is beautiful!!! I haven’t done any colorwork yet, but have yarn picked out for a couple projects…This one is definitely getting added to my list! I love love love it!!! The colors are perfect, and I especially love how thoughtfully you sized it Elinor, srsly, if only every designer were so awesome! Such a pretty sweater and lovely color combination! this is stunning. yay baby! Your sweater is gorgeous! Please enter me for the contest. Thanks! This is absolutely gorgeous sweater and I belive, that it is joy and fun to knit it. Wow! What a beautiful sweater. Good job! I love the grays and purples together. I have knitted 1 simple fair isle hat. I enjoyed making it and would like to try to make the pullover. Lovely design, colors and photos. Nice work! Beautiful sweater! It’s in my queue — can’t wait to make one myself! What an awesome pattern. It’s sweet but not too girly. My girlfriend’s hands got twitchy when she saw this. I hope I win so I can give this kit to her. I love your colorwork patterns. I will have to add this to my ever growing list of want to knit. Oh my goodness! That is absolutely lovely! When the pattern comes out, I’m definitely buying it! Im in awe of your skills at designing this! When I was pregnant I forgot how to tie my own shoes. Of course I couldnt reach them anyway. That is absolutely beautiful! Excellent job! What a great give-away! And congratulations on the soon-to-be-born baby! Pregnant bellies are so cute. WOW! Great sweater, great contest… great belly! 🙂 Thanks for a chance to win. I would cast this on immediately! As usual a beautiful result! Gorgeous sweater, lovely mom and soon to be beautiful baby! Thanks for the chance to win. Ooo, lovely. And congrats on the baby too! Of course if I win I’ll have to stretch my knitting skills (quite) a bit! It’s georgeous! The belly, I mean. The sweater is lovely too of course. Your sweater is absolutely beautiful. Great job! I love this sweater! I think it maybe the thing that makes me brave enough to finally try steeking. Your sweater is one of the most beautiful knitted garments I have ever seen. I had to call my husband in here to look at it and now he’s gushing over it. That is just lovely! What a gorgeous pattern! Such a pretty sweater! It’s very subtle, and definitely something I could see myself wearing! It’s lovely! The subtle color changes are so attractive. Gorgeous Sweater! Looks so beautiful; I’d love to make one also. I’ve been waiting and longing for my first fair isle project to try now that I’ve gotten the guts for it. I think you’re the one! seriously have to wait to more days?? It will be hard. One of my fav yarn shops that’s a hour away carries Harrisville yarns. Can’t wait for my next trip now! At first I just looked at the photos, without reading your text, and I thought “Why is she not showing a full body view of this sweater, why is she just showing bits of it? It’s hard to see how it looks!” Then I read your whole post and found your belly photo. Too funny! Good luck! and it’s a lovely sweater. A beautiful sweater and the colors are perfect! Can’t wait to get started on it. Thanks for another great pattern. Ooooo! I would love to make this. Do you think it would be very difficult to adjust for a guy? What a beautiful sweater — I love the colors. Enjoy this special time in your life! Oh my! I saw this sweater and knew I had to make it! Oh – then I saw it is not available till tomorrow – and the contest – woohoo! What a great deal! 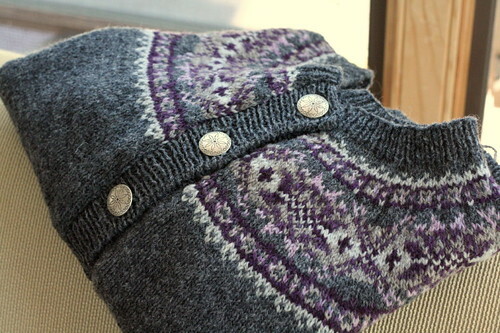 I have never done fair isle and want to try so bad – this is the project for me! Cannot wait to start – oh yeah or maybe win! Yeah! Best wishes to all of you above! and below! I’ve yet to do a fair isle item that wasn’t a hat or a scarf. What a great project. what a lovely pattern and color choice! great job yet again! What a gorgeous sweater! I have a vest that my mum knit when she was 21 (60 years ago) in similar colours. It is too small for me now but every once in a while I pull it out of the cedar chest and think about making something like it. Thanks for posting the baby bump photo – love it. What a gorgeous sweater! I am crossing all my fingers & toes on this one! Fantastic color choice for this sweater… i’ll be adding it to my queue! Beautiful sweater! Grey & purple are some of my favorite color combinations, and the subtlety here definitely caught my eye. So beautiful it got me out of my usual lurking habit. That and the promise of my first fair isle being done with a pattern and yarn from you! Thanks for all your posts. This is such a beautiful sweater! So glad I found your contest. Looking forward to seeing more of your designs. Best of luck with your new little one. I’m going to assume that you will NOT be playing futsal this winter. Such a shame – but such a gorgeous sweater, Elinor. My word – if I don’t win, you can rest assured I’m going to 1) buy the pattern, and 2) insist on a gift certificate to the Yarn Barn for Christmas. I love purple and gray together. The yarn, the fabric, the colours.. all just fantastic! Oh I love this sweater! The colors are perfect for me, exactly what I would pick in the store but so much better because I can knit it myself! You look gorgeous in your flickr pic (btw) with your new cardi! What a gorgeous sweater! The color combination is so peaceful to look at. I love it! This is beautiful. I’m totally asking for the yarn for Christmas, because I simply must have this sweater! Love the sweater – classic yet current. For a chance to win a kit, you bet I’ll leave a comment! Wow, that is a beautiful sweater! I love your color choices. I just bought several skeins of Harrisville while on vacation…it’s a great yarn. Great job! I can’t believe how pretty that sweater is!! I’m due in a month (eek a month!) and understand the ‘not-fitting’ thing 🙂 You look great though! Wonderful wonderful job! This is a lovely pattern. I am looking forward to buying it in your shop! So pretty! The colors are gorgeous and the sweater itself looks so soft and pettable! I love this sweater–I found you yesterday while googling around. I have been wanting to do a fair isle pattern for awhile, but didn’t want something for me to wear that was ‘loud’…I absolutely love the subtleness in the design and color pallete and would love to knit this! I have not tried this particular kind of yarn…but it is beautiful. What a wonderful project…thank you for sharing. Wow! This is beautiful! I picked out some yarn from another company for it, but after your raves about Harrisville, I may just change my mind. Can’t wait to get started! Thanks for the pattern. I hope I’m not too late to enter! Your sweater is beautiful and I really want to make one for myself!